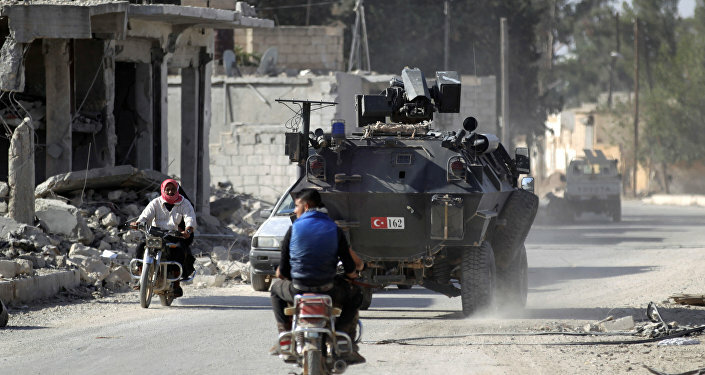 Turkey is building a concrete wall topped with barbed wire on the border with Syria to stop the passage of militants. A Sputnik reporter witnessed the construction of the wall and found out whether it will actually be capable of stopping the terrorists. The construction of the first section of the wall in the town of Kessab, west of Idlib province, Syria is now complete. Construction of the wall has moved to the city of Kamishli in the east. The height of the wall is up to 3 meters, not counting the barbed wire on top of it. Since the beginning of the Syrian crisis, Turkey's position towards its southern neighbor has changed dramatically. At first Turkey supported those who believed "Assad must go" and it was adamant to create a buffer zone in Syria. Now things have changed and Turkey has acceded that the Syrian president should stay in office, however, the wall must be constructed to keep the terrorists out. Turkey, in its defense has declared that the wall will help guards to monitor the border and see who crosses it. In Syria, however, the authorities are less than excited about this wall considering that Turkey did not clarify the exact border demarcation with Syria before beginning construction. Could Turkey have sneakily acquired a little of the Syrian land in the process? According to some reports, it has. Also, from the beginning of the war in Syria, the Syrian-Turkish border which has a range of 822 km, saw a large amount of militants pouring into Syria from Turkey with weapons, machine guns and radical ideas in tow.